Another awesome and versatile dip blend and 1st Place winner in “Flavor of GA” Contest! Yeah!!! 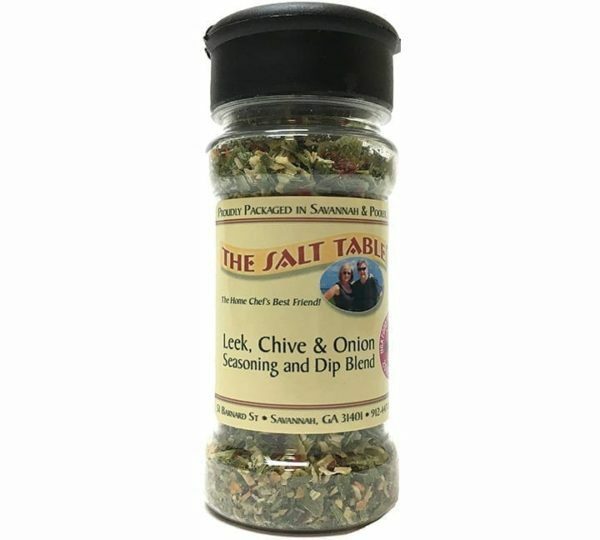 The Salt Table was a WINNER for two years in row in Flavor of Georgia Contest with Carol’s Leek, Chive & Onion Blend. The Salt Table won a 1st place a year earlier with the Tybee Island Coastal Blend. This is great as a dip for chips and veggies, or a topper for baked potatoes, just mix with sour cream. It is also wonderful in flavoring tomato or broth soups, or as an omelet seasoning. Add a tablespoon to mayonnaise for a flavorful sandwich spread. Another suggestion – mix with melted butter and make wonderful home made croutons! The Flavor of Georgia showcases delicious, innovative, market-ready prototypes or commercially available food products. Entries are judged on technical aspects such as flavor, texture, and ingredient profile. Also considered are potential market volume, consumer appeal and how well the product represents Georgia. The Contest has succeeded in helping increase exposure, publicity, business contacts and sales for finalists. More than 1,000 products have entered since the Contest began in 2007. Ingredients: Dried leek, green onion, garlic, onion, salt, chive, dill, red pepper flakes. ALL NATURAL WITH NO MSG. Combine the cheese, butter, and mustard in bowl of food processor and process until smooth. Or combine in mixing bowl and whip with electric mixer at medium-high speed until smooth. Whip in the whiskey a tablespoon at a time. Then season well with Leek, Chive, and Onion Blend. Transfer it to crock, cover, and let sit at least 1 hour. Taste and adjust the Seasoning Blend and let sit at least 30 minutes to allow the seasoning to meld. If not serving within another hour, cover and refrigerate until needed. 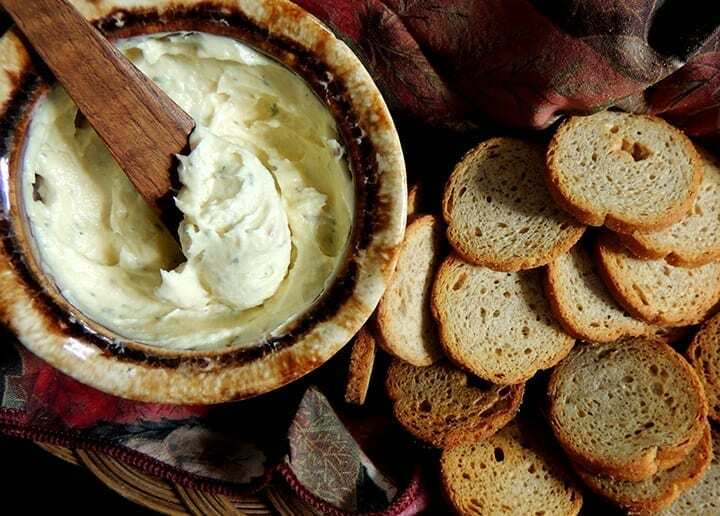 Let warm to room temperature at least 30 minutes before serving as a spread with crackers or toast rounds. Leek, Chive & Onion Seasoning and Dip Blend is an Award winning Blend! 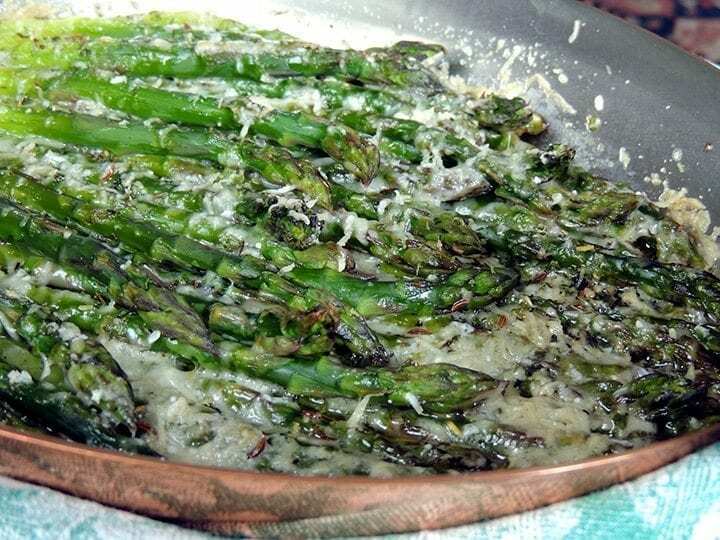 One of the great dishes of spring’s table in Parma, Italy, is fresh, fat asparagus, layered with butter and cheese and baked until the cheese is just barely golden. The Salt Table’s Shamrock Dust really brings out the fresh spring flavor in this classic dish. Cut off about an inch of the asparagus stem base and stand it in a vase or bowl of cold water for at least half an hour. Peel the tough parts of the stem with a vegetable peeler and drop them into a basin with cold water. Leave the asparagus in the water until you are ready to cook it, but for no more than 2 hours. Bring 2 inches of water to a boil in a large, deep skillet and prepare a basin of ice water. Add about a tablespoon of salt to the boiling water and slip in the asparagus. Cook 1-2 minutes, then immediately drain and drop into the ice water until cold. Drain and pat dry. 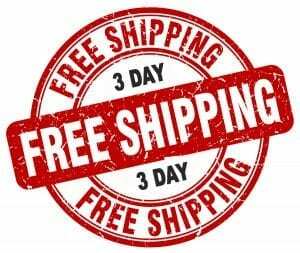 This can be done up to 2 days ahead. Half an hour before serving, position a rack in the center of the oven and preheat to 450° F. Butter a 3-quart casserole or gratin dish. Layer the asparagus with a sprinkling of Shamrock Dust, melted butter, and a little Parmigiano, overlapping slightly. Sprinkle the remaining cheese over the top and bake until golden brown, about 10-15 minutes. * Another Salt Table Blend that are great with asparagus is Leek, Chive, and Onion Seasoning and Dip Blend and Tybee Island Coastal Blend. 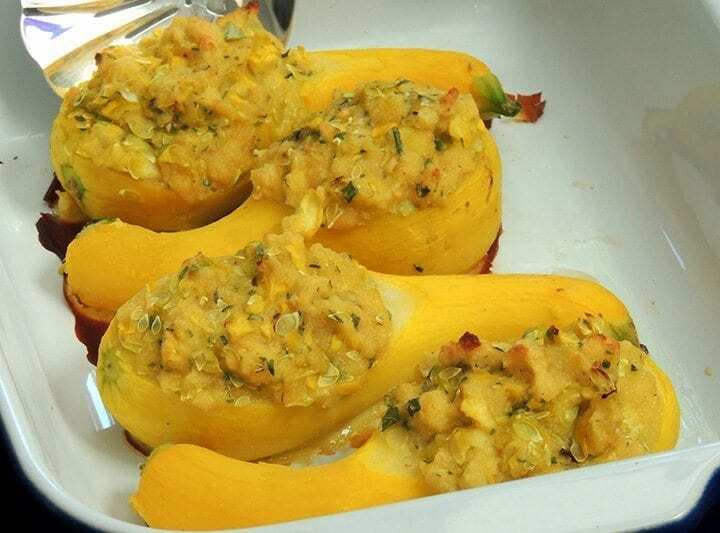 Stuffed yellow crookneck squash was a specialty of my maternal grandmother. Her stuffing was a simple mixture of the chopped pulp, soft breadcrumbs (sometimes from leftover biscuits), chopped green onion, egg, and seasonings. Later on, she began adding dried herbs. They’re a snap with The Salt Table’s Leek, Chive, and Onion Seasoning and Dip Blend: there’s no onion to chop and the seasonings are all blended into one jar. They would also great with Southern Herb Garden Blend. Position a rack in the center of the oven and preheat to 350° F. Put the squash into a heavy-bottomed 4-quart pot and add enough water to cover them by 1 inch. Lift out the squash, cover, and bring the water to a boil over high heat. Meanwhile, scrub the squash under cold running water. Put them in the pot, cover, and let it come back to a boil. Uncover, adjust the heat to a simmer, and cook until squash are nearly tender, about 10 minutes. Remove them with a slotted spoon or frying skimmer to a cutting board so they lie flat without rolling, and let them cool enough to handle. Slice off but reserve about 1/4 inch of the top side of each. Using a melon baller or small, sharp-edged spoon, carefully scoop out the center pulp of each, leaving about 1/4 inch of outer flesh intact, taking care not to puncture shell. Squeeze the excess moisture from the pulp and chop it along with the reserved top slices. Put them into a mixing bowl, add the soft crumbs, and 1 tablespoon of Leek, Chive, and Onion Blend. Mix well, taste and adjust the seasoning blend, then add the eggs and mix well. The Salt Table’s Shamrock Dust and Leek, Chive, and Onion Seasoning blends are great for flavoring weeknight casseroles, especially fall broccoli. 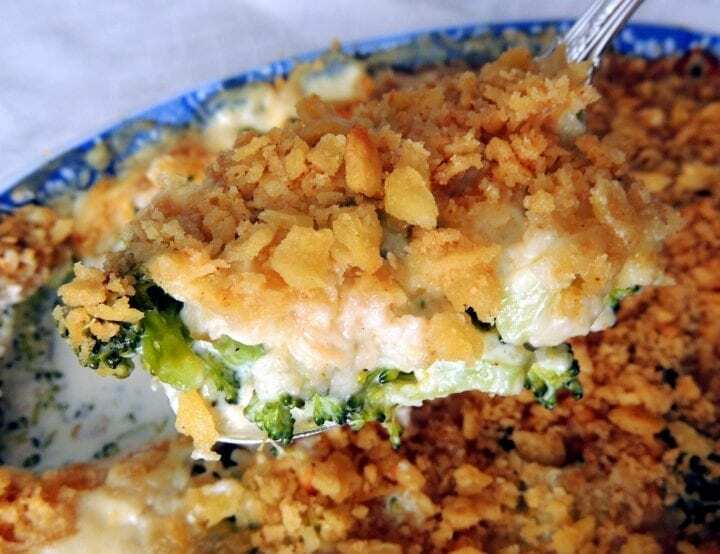 This gratin is a fresh take on an old favorite using fresh broccoli and real cream, and thanks to The Salt Table’s seasoning blends, it’s as fast and easy as the old standby with frozen vegetables and a can of cream soup. Prepare a large, wide saucepan or Dutch oven with 1-inch cold water. Put in a steamer insert, making sure the water doesn’t touch its bottom. Cover the pot and bring the water to a boil. Wash and trim the broccoli and peel the tough stems. Cut off the stems and cut it in 2-inch lengths, then divide the florets into smaller pieces. When the water is boiling, add the broccoli to the insert, cover, and steam 2 minutes, then sprinkle with Pink Salt. Cover and steam until just tender but still bright green, about 6 minutes more. Remove from the steamer and let cool. Lightly butter a 9-inch gratin dish or shallow casserole. Roughly chop the broccoli and put it in dish. Sprinkle it with the Seasoning Blend and mustard. Set aside ¼ cup of the cheese and add the remainder to the casserole. Gently toss to mix, taste and add more seasoning blend if needed, then level the top with a spatula and sprinkle and pour enough cream over it to almost cover the broccoli. Sprinkle the reserved 1/4-cup of cheese evenly over the top. Note: The gratin can be made up to this point as much as 4 hours ahead. Let it completely cool before loosely covering it, and let it stand at room temperature. About 45 minutes before you’re ready to serve, position a rack in the upper third of the oven and preheat it to 375° F. If you’ve made the gratin ahead, uncover it and sprinkle the crumbs evenly over the top. Bake in the center of the oven until bubbly and lightly browned, about 35-40 minutes. Let it settle for 5-10 minutes before serving, but serve it hot. 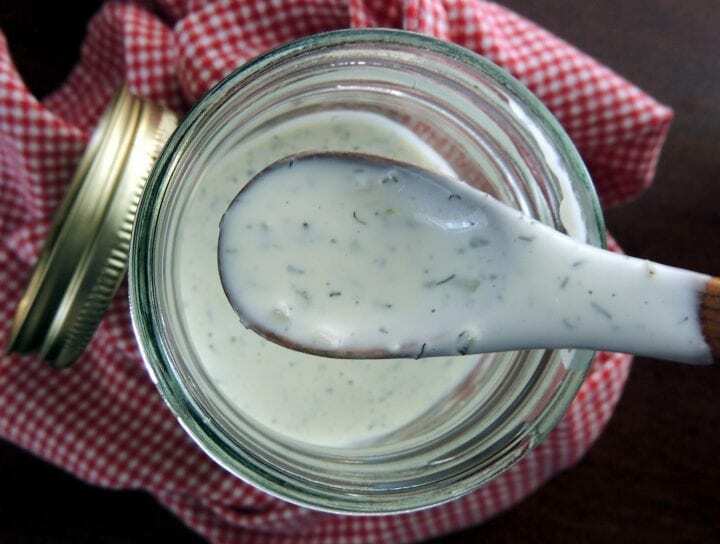 Homemade ranch dressing is perfect with fall salads, especially those with an autumnal flare thanks to apples, pears, pecans, walnuts, and blue cheese. 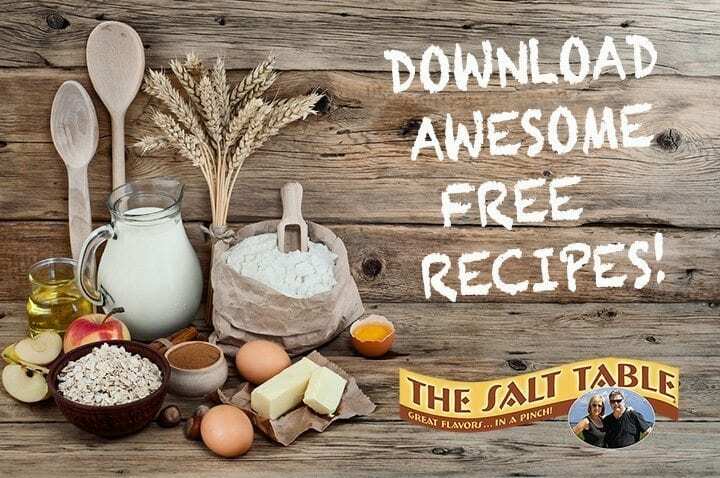 The Salt Table’s Leek, Chive, and Onion or Shamrock Dust Seasoning Blends make homemade ranch dressing a snap. Whisk together sour cream or yogurt and mayonnaise until smooth. Gradually whisk in buttermilk. Whisk in mustard, Seasoning Blend, herbs, and lemon juice or vinegar. Cover and chill at least 1 hour to allow flavors to blend; 6-8 hours is better. Can be made 3-4 days ahead. The Salt Table’s Leek, Chive, and Onion Seasoning Blend and Shamrock Dust are not only for spring or for beguiling Leprechauns. They’re great with autumn vegetables and in hearty fall and winter soups and stews. Either blend gives this fall favorite a wonderful lift. If you’d like a richer soup, stir in half a cup of heavy cream just before serving. Warm the butter and shallot in a large, heavy-bottomed saucepan over medium heat. Sauté until softened, about 3-4 minutes, then add the squash and toss until hot. Add the broth, the Seasoning Blend or Shamrock Dust, and sage, and bring to simmer. Adjust the heat and simmer until the squash is very tender, about 20 minutes. Taste and adjust the seasoning with Pink Salt as needed. Let simmer a minute longer, turn off the heat, and let it settle for 5-10 minutes. Remove and discard the sage and puree the soup, either with a hand blender or in batches in a regular blender or food processor fitted with the steel blade. It can be made up to three days ahead: cool, cover, and refrigerate until needed. To serve, gently reheat the soup over medium low heat, stirring often. If it has been made ahead and has gotten too thick, thin it with water as needed. Taste and adjust the seasoning, simmer 2-3 minutes longer. 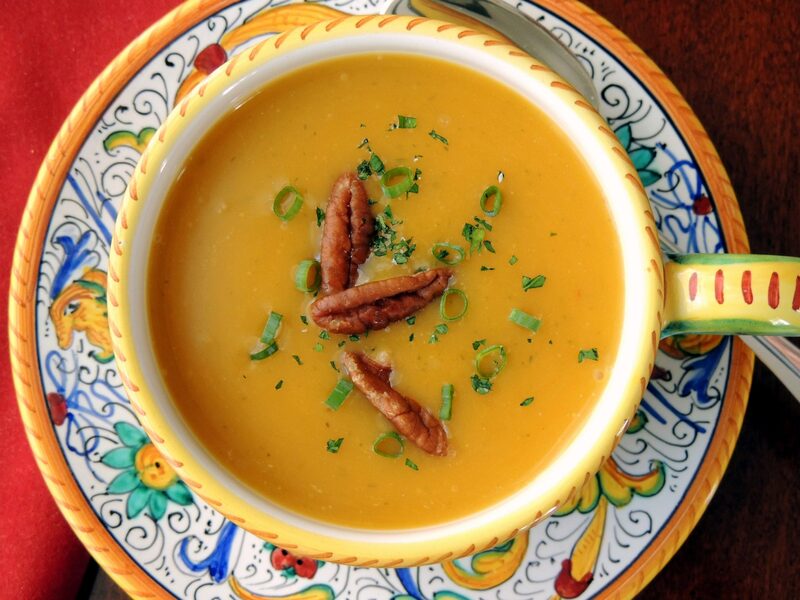 Ladle it into warm soup bowls and garnish with green onions and toasted pecans. All ‘Round Good Grinder Blend is ideal for marinades and vinaigrettes, providing all the flavorings the marinade will need with a simple twist of the mill. It’s especially cooling way of using up the leftover roast, but in Savannah’s changeable climate, it can be a welcome supper dish at any time of the year. Try it also with roasted pork tenderloins or leg of lamb. Make the vinaigrette: chop the garlic fine and sprinkle with salt. Rub it to paste with a flat side of the knife. Scrape it into a mixing bowl. Whisk in vinegar and mustard. Slowly whisk in oil, a few drops at a time, until emulsified. Whisk in 1 teaspoon Good Grinder Blend and thyme. Set aside 10-15 minutes, then taste and adjust the seasonings. Put the beef in a glass or ceramic bowl. Drizzle vinaigrette over it, toss, then cover and refrigerate at least 2 hours or until needed. Make potato salad: Put 1 inch water in pot fitted with steamer insert and bring to rolling boil over medium high heat. Scrub potatoes under cold running water, slice 1/4-inch thick, and put in steamer insert. Cover and steam until just tender. Transfer to mixing bowl and while still hot sprinkle lightly with wine. Toss and let sit a few minutes. Sprinkle lightly with vinegar and season with Leek, Chive, and Onion Seasoning Blend. Toss and let cool. Drizzle with olive oil. Toss, taste, and adjust the vinegar, oil, and seasoning blend. Set aside until completely cooled. Line a platter with whole lettuce leaves. Tear the remaining leaves into bite-size pieces. Drizzle lightly with vinaigrette, toss and spread over the whole lettuce leaves. Add the scallions to the marinated beef, toss, and spread it over the center of the platter. 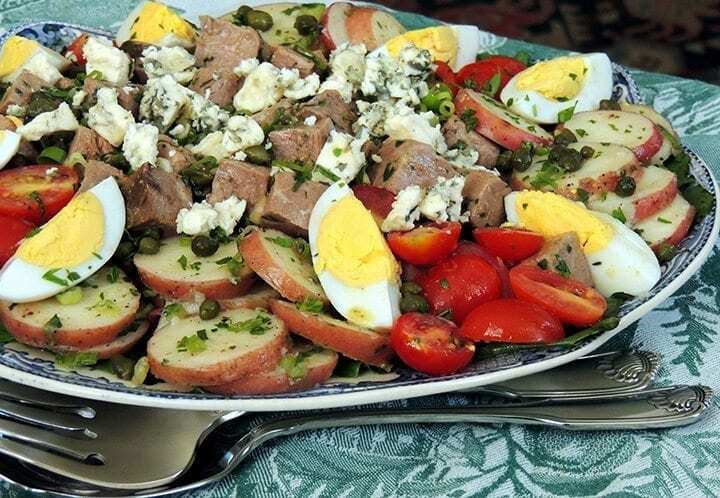 Arrange the potato salad around the beef in several mounds. Toss the tomatoes with a spoonful of vinaigrette and arrange them between the potatoes. Scatter the capers over the beef, potato salad, and tomatoes. Arrange the wedges of egg around the beef and drizzle them with vinaigrette. Sprinkle Roquefort cheese over the salad to taste and finish with a sprinkling of parsley. Serve at once, passing the remaining vinaigrette separately. 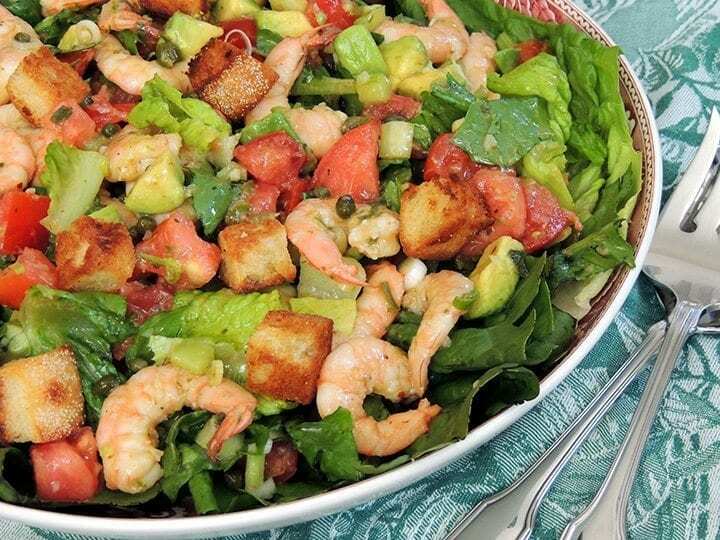 Southerners love their seafood, and shrimp is on the top of that list because it is so versatile in so many dishes, especially salads. This salad features ‘Tybee Island Coastal Grinder Blend’ and ‘Leek, Chive and Onion Blend,’ and we think you’ll absolutely love it! Completely peel the shrimp for this. Nothing is more irritating than having that pretty but inedible bit of tail fin on the end of a shrimp that you’re trying to eat with a knife and fork. Bring 3 quarts of water to boil in a large pot. Add the shrimp and simmer until 3-4 shrimp float, about 1 minute. Drain, rinse under cold running water, then grind Tybee Island Blend liberally over them and toss well. Let cool completely, then peel and devein. The shrimp will pick up the seasoning as you peel them. 2. Make the vinaigrette: chop the garlic and sprinkle it with salt. Rub it to a paste with the flat side of the knife. Scrape it into a mixing bowl and whisk in the lemon juice, vinegar, and mustard. Whisk in the oil a few drops at a time until emulsified and whisk in 2 tablespoons of Leek, Chive, and Onion Seasoning. Set it aside 10-15 minutes, taste, and adjust seasonings and lemon juice. Put the shrimp in a bowl and pour all the vinaigrette over them. Add the celery, scallions, and capers, toss well, cover, and refrigerate at least 2 hours or until needed. To serve, line a platter with lettuce leaves. Tear the remaining lettuce into bite-sized pieces in large salad bowl. Core and if desired peel the tomatoes, then halve, seed, and dice them and add them to the shrimp. Halve, pit, peel and dice the avocadoes and add them to the shrimp. Gently toss. Lift the shrimp, avocado and tomato from the vinaigrette with a slotted spoon and add them to the lettuce. Toss well, taste, and add the reserved vinaigrette as needed. Spread the salad on the lettuce-lined platter, tear the basil into small pieces over it. Scatter croutons over salad if using and serve immediately, with the remaining marinade passed separately. Butter-Toasted Croutons: Cut 2 1-inch thick slices firm, crusty bread into 1-inch cubes. Warm 1 tablespoon olive oil and 1 tablespoon butter in large skillet over medium heat. Add bread and toss to coat. Pan-toast, tossing regularly, until evenly browned and crisp, about 6-8 minutes.